When you’re in the market for an SUV near Lee’s Summit, North Town, Overland Park, Mission, and Olathe, MO, you’re probably interested in interior space. The increased space is one of the best features of any SUV—even a compact SUV like the 2018 Volkswagen Tiguan. You can read all about the numerous interior features, but sometimes the best way to understand is to dive into the numbers. The numbers don’t lie, and the VW Tiguan has some of the most impressive ones you’ll find. 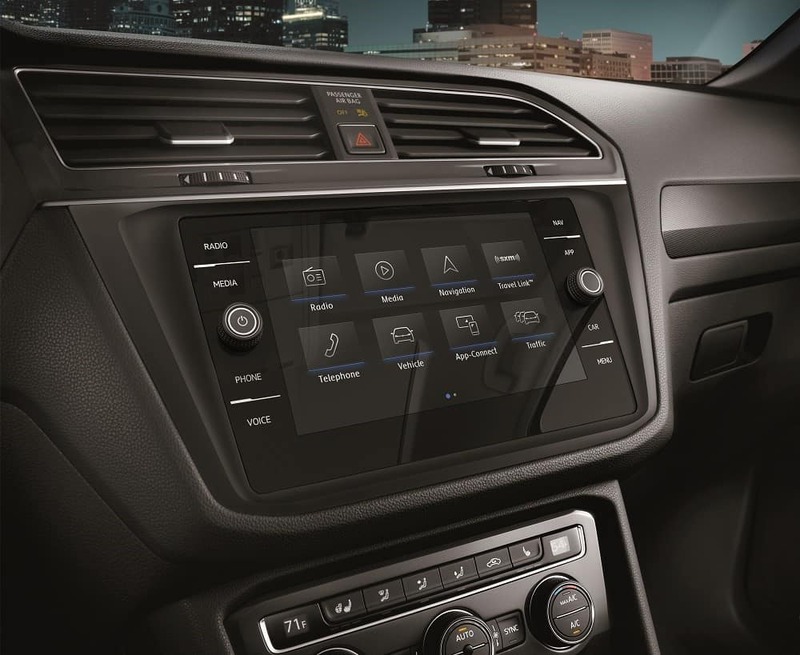 Take a look at the 2018 Volkswagen Tiguan interior dimensions and discover if this incredible compact SUV has all the interior space you need in your next vehicle. Read our 2018 Volkswagen Tiguan Review to learn more about this impressive vehicle. This remarkable vehicle can seat up to five passengers, and they’ll all have plenty of room. You and your front passenger can enjoy an especially roomy ride with 39.6 inches of headroom and an impressive 40.2 inches of legroom. There are some SUVs that don’t have that much legroom in the front. You also get 57 inches of shoulder room, so you’ll always have plenty of space to sit comfortably. In the back, your rear passengers can enjoy similar comforts. Their available headroom comes in at 38.9 inches, while their legroom rests at a comfortable 38.7 inches. That’s just a few inches off from the front legroom, so you won’t likely hear your tall friends complaining too much about sitting in the back. With 55.8 inches of shoulder room, they’ll have all the space they need in your second row. If you fold the rear row of seats down flat, your available cargo space extends all the way to 73.5 cubic feet—that’s among the best cargo capacity dimensions you’ll find in this entire class. With easy-to-fold-down seats complete with release levers, you won’t have any trouble adjusting the layout in the VW Tiguan in order to accommodate your desired combination of cargo and passengers. The VW Tiguan may be easy to drive, but that doesn’t mean it’s not still an SUV. That’s why some versions feature an available third row if you want to take some additional passengers along for the ride. Even for third row seating, the dimensions are still quite impressive. 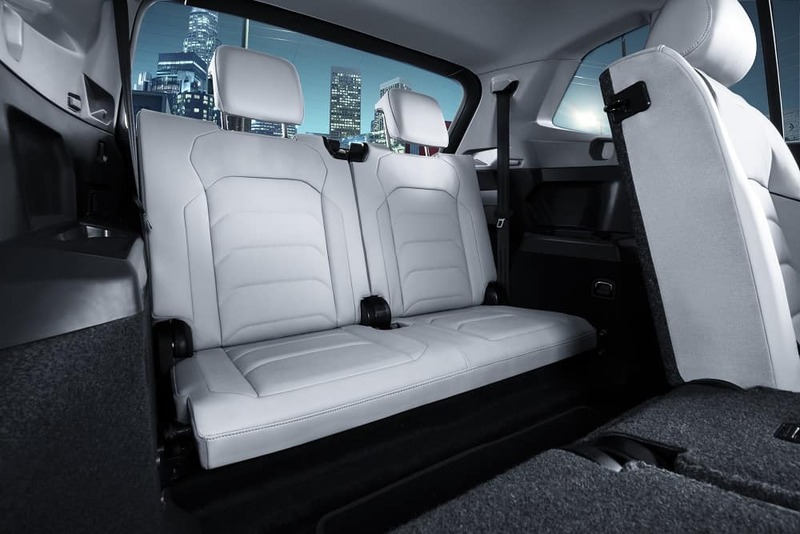 Passengers all the way in the back can enjoy 33.8 inches of headroom and 27.9 inches of legroom. While you will want to save the seats towards the front for your taller friends, the third row makes a great place for kids to sit. Now that you’ve seen the 2018 Volkswagen Tiguan interior dimensions, it’s time to check out this SUV in person. You can wrap your head around the precise measurements best when you have the vehicle right in front of you. Come down to Volkswagen Lee's Summit, serving the areas of Lee’s Summit, North Town, Overland Park, Mission, and Olathe, MO, where our knowledgeable staff is happy to go over every inch of this SUV with you. Visit us or contact us to schedule your test drive today!